Once again, Mini is challenging the definition of its own brand name. The 2017 Mini Countryman grows significantly in its second generation, but retains the look and proportions of the original Mini crossover. Does the new model wear Mini’s characteristic styling better than the last one? You be the judge. Many of the changes take place in front, with the Countryman gaining new headlights with a more angular design. 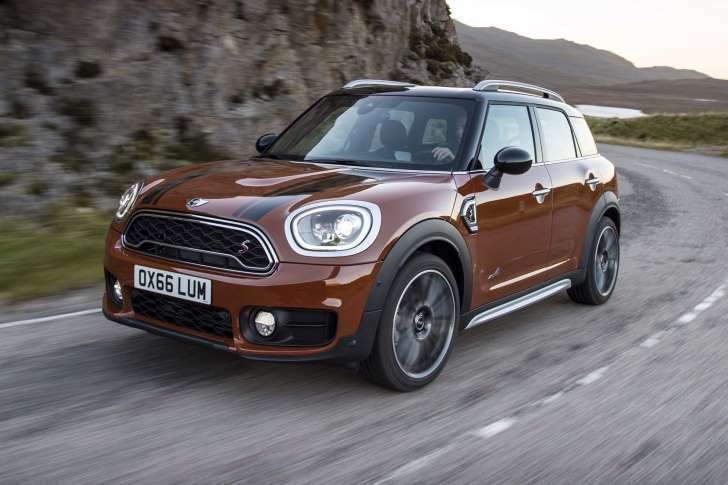 All models now sport a grille with downturned corners, giving the Countryman more of a frowny face. This look was previously only available on S and JCW models, and was refined to its current shape with the 2015 refresh. Two large rectangular intakes now surround the foglights, which are still round but placed closer to the center of the bumper. Though it’s difficult to tell the difference between the two models from the side, the new Countryman is at least 8 inches longer than last year’s model, with a wheelbase that’s 2.9 inches longer. You can see the added length in the rear overhang. The roof spoiler is retained but the front fender vent has changed shape and been relocated. The new Countryman’s taillights look like the original’s but are larger, now spilling onto the hatch. The lamps also feature three-dimensional LED rings inside the housings. The license plate has been moved from the bumper to a recessed area of the liftgate. The Countryman badge still spans nearly the entire width of the hatch in big letters. Inside, the overall Mini aesthetic is retained, but there are a few noticeable changes. The round HVAC vents have been replaced with rectangular pieces. The large circular center stack carries over and still houses the infotainment screen, but the giant analog speedometer is gone. LED illumination around its diameter simulates a tachometer in sport mode, however. The infotainment control knob moves to the center console and now features a touchpad, while the HVAC controls have been cleaned up and reduced to three knobs. What do you think of the 2017 Mini Countryman? Did Mini play it too safe or did it bring the model toward its logical next step? Tell us in the comments below. Last week, we asked you to compare the 2018 Volkswagen Atlas’ styling against three other large, three-row crossovers, and many of you found VW’s newest sport ute to be the looker of the group.